From Spain originally, Olaia came to Chelsea to study MA Textile Design. As she prepares for the show she tells us how, through her work, she aims to raise awareness of brain disease and what her plans are for the future. 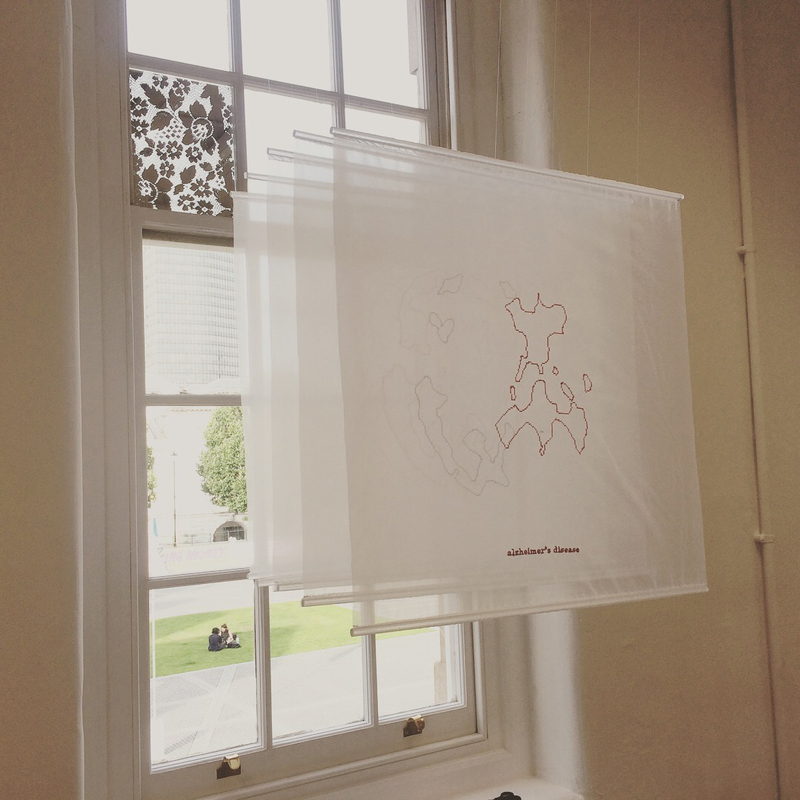 When I started I had a clear idea: linking textiles with well-being. The whole course has been a journey of discovering my voice as a designer, learning and trying different textile techniques, sharing experiences and knowledge with my classmates and directing my own project. 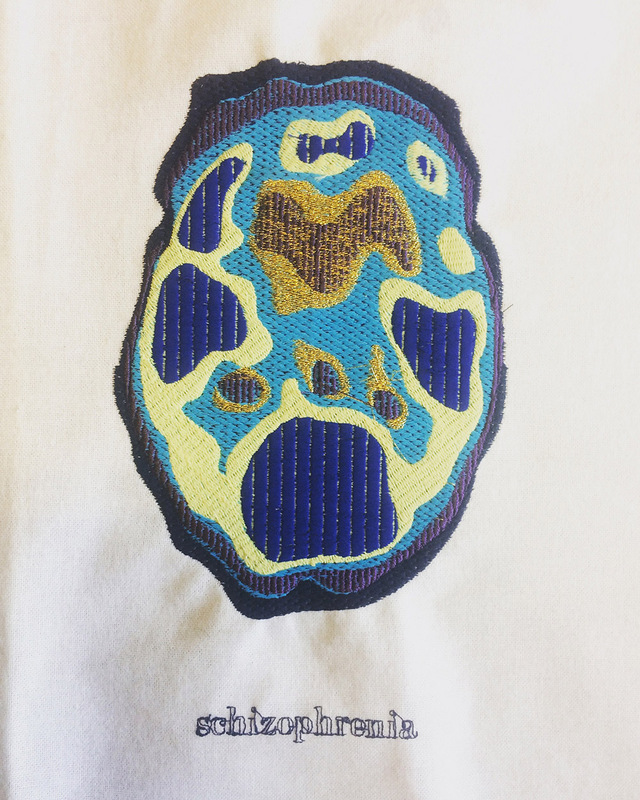 The aim of my work is to raise awareness and de-stigmatise brain diseases through textiles. I have made two pieces, each piece composed of semi-sheer 5 panels that have a tridimensional effect. One piece depicts a PET brain scan of someone suffering from Alzheimer’s Disease and the other one Progressive Supranuclear Palsy; both are neurodegenerative diseases. Each panel is a slice of the brain. 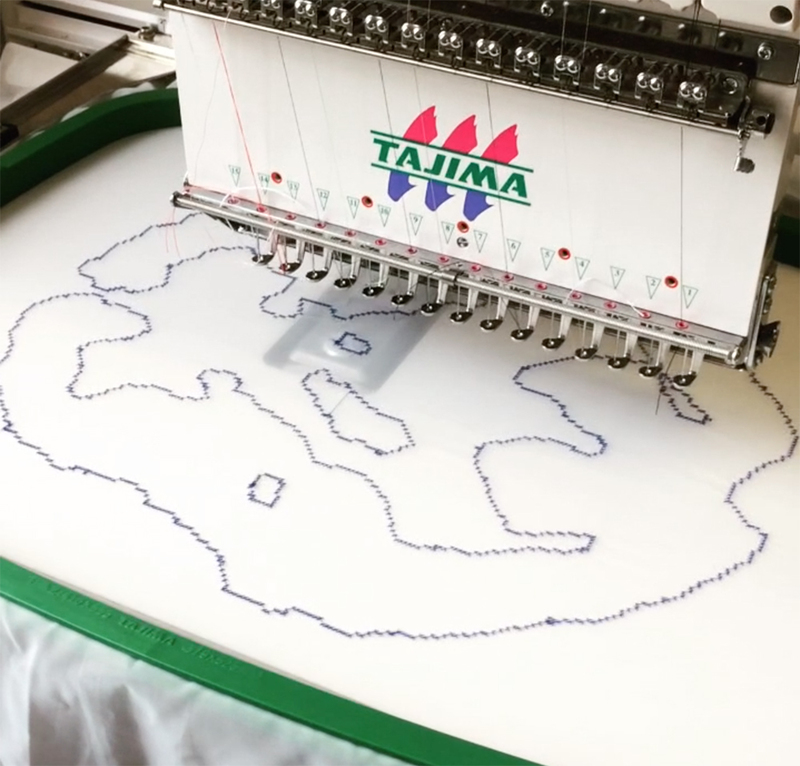 I’ve chosen digital embroidery design, as it has the accuracy of a digital machine, like the brain scans do, but also, the stitches have humanity. And I have not used just any stitch: I have chosen to use cross-stitch, as it universally represents the art of stitching and its therapeutic benefits. Choosing just one idea and realising it as I picturing it in my head. Also, as my work has a social “guerrilla” component, I wanted to make sure I was communicating the message correctly. In technical terms I had to try many materials and styles till I find the ones that had the perfect look and feel for the project. Initially I would like to work for a textile brand to learn from the industry, while I gradually build my career as a textile artist. Also, I wouldn’t mind having my own studio/workshop in the future. It’s a nice creative and cooperative atmosphere. The site is also very interesting, as it is the former building of the Royal Army Medical College. I like the river, I think its vastness it’s very relaxing. There are also some unique buildings such as the Houses of Parliament and plenty of art galleries and museums. Bear in mind this is a mostly self-led course, although the tutors are always there to help you. Be flexible: maybe what you thought you were going to do at the beginning will turns into something completely different at the end. Explore all the possibilities and make the most of the workshops.